Sherrod Baltimore is a defensive back currently playing with the Ottawa REDBLACKS. Signed as a free agent on April 5, 2017. Played in 13 regular season games and the one playoff game for the REDBLACKS. He had 47 defensive tackles. He recorded a season-high 8 defensive tackles against the Saskatchewan Roughriders on Oct. 13. 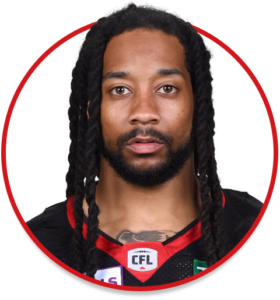 Voted REDBLACKS Most Outstanding Rookie. Was an all-state basketball point guard in high school, as well as a quarterback. Played four seasons with the University of Maine Black Bears. Recorded at least one defensive tackle in every game he played during the 2017 CFL season.